Ottoline’s parents are collectors and spend most of their time travelling and so Ottoline spends a lot of time alone with only Mr Munro, a very hairy creature from a bog in Norway, for company. She is curious about other residents in her apartment block and likes solving mysteries. When she discovers a spate of burglaries and missing lapdogs Ottoline is keen to investigate. 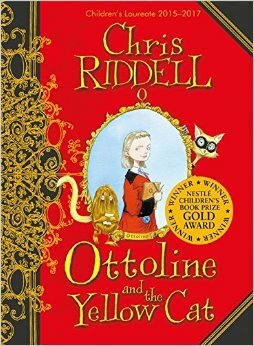 Children will enjoy solving the mystery with Ottoline. The detailed illustrations of scenes in the story and the characters together with a wonderful array of maps, plans and postcards provide lots to talk about and enjoy. This is a story to inspire children to find a disguise, a notebook and set off solving imaginary mysteries of their own. Which character do children find most interesting? Why have they chosen this character? You might want to talk with your child about how Ottoline would feel when she receives the postcards from her parents. Is she lonely on her own? Some of the vocabulary is likely to be unfamiliar, you could discuss words like ‘subterfuge’ and ‘pedigree’ and look them up in a dictionary. Collect together some suitable clothes eg hats, gloves, scarves, sunglasses so that children can choose a disguise. A notebook and possibly a magnifying glass might complete the outfit so children can set about secretly looking for clues. Take photos of your child dressed up in their favourite disguise. Role play a conversation with your child, with one of you as Ottoline and the other a news reporter, talking about her success in catching the yellow cat burglar. Write a news report about Ottoline’s success in solving the mystery. Here is a template. Children could include an interview with Ottoline and add their drawings or a photograph of them in disguise like Ottoline.